Phoronix Test Suite is a comprehensive testing and benchmarking platform available that provides an extensible framework for which new tests can be easily added. The software is designed to effectively carry out both qualitative and quantitative benchmarks in a clean, reproducible, and easy-to-use manner. This entry was posted in osde and tagged open source, sysadmin on 23/12/2010 by osde8info. This entry was posted in osde and tagged android, mobdev, mobile, open source on 23/12/2010 by osde8info. This entry was posted in osde and tagged mobdev, mobile on 23/12/2010 by osde8info. 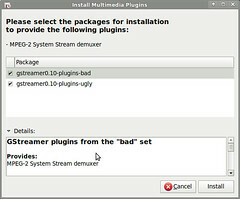 ubuntu gnu/linux still doesn’t play my ‘mamma mia’ or ‘postman pat’ dvds ! This entry was posted in osde and tagged multi media, open source, ubuntu on 18/12/2010 by osde8info. you can now find the intel appup powered app stores everywhere ! and the intel appup sdk for intel atom netbooks is available for C, C++, .net, meego & now java too ! This entry was posted in osde and tagged atom, intel, java, meego, webdev on 18/12/2010 by osde8info. why didnt anyone warn me about drupal dependancy hell ? so thats 7 drupal module dependancys ! is there an aptitude or yum like installer for drupal ? This entry was posted in osde and tagged lamp, webdev on 12/12/2010 by osde8info. This entry was posted in osde and tagged mobdev, webdev on 10/12/2010 by osde8info. 12:39:48 E/DeviceMonitor: Sending jdwp tracking request failed! 12:39:50 E/DeviceMonitor: Sending jdwp tracking request failed! This entry was posted in osde on 05/12/2010 by osde8info. It turns out the trudge through 4″ of snow to todays Apps World today was worth it. Not least for picking up a copy of the Mobile Developer´s Guide To The Galaxy (6th edition) – and thats not just Samsung Galaxy s! Thanks to Enough Software it turns out any other potential mobile developers can avoid the snow and download a PDF version directly ! This entry was posted in osde and tagged android, mobdev, mobile, webdev on 01/12/2010 by osde8info. This entry was posted in osde and tagged android, mobdev, mobile, open source on 01/12/2010 by osde8info.